Taking photos and shooting videos are exciting and interesting activities especially when you are using the correct tools and gadgets. This includes an ideal camera combined with a perfect lens kit. Check out the Nikon AF-P DX Nikkor 10-20mm f/4.5-5.6G VR Lens, as this is built to satisfy your basic and intricate photography needs. The Nikon AF-P DX Nikkor 10-20mm f/4.5-5.6G VR Lens can truly capture the feeling and emotion of a place or thing. Its amazing features let you capture various subjects such as landscapes, cityscapes, interiors, architectures, or even group photos of friends and families. There is so much more to see and explore with this durable and heavy-duty lens kit. This camera kits lens has an ultra-wide-angle view that lets your creativity works with composition. It surpasses any other lens with its focal length of 10-20mm and minimum focus distance of 0.22mm or 0.8 feet from the focal plane. The lens kit has an angle of view ranging from 109 to 70 degrees. Its maximum diameter is approximately 3.03 inches with a 2.87-inch distance from the camera lens mount. The lens is equipped with innovative optics to deliver beautiful images and videos even during challenging conditions. Its maximum aperture is f/4.5-5.6 while its minimum aperture is f/29. The stepping motor of this lens has a near-silent autofocus feature making it ideal for video recording. It is highly compatible with DX formats. The VR image stabilization is responsible for keeping handheld images and videos sharper. It makes low-light shooting a lot easier with its slower shutter speed and 14 lens elements. This VR feature also lets you play with a new foreground, middle ground, background, patterns, lines, symmetry, and others for more creative and dramatic shots. It has three aspherical lens elements that eliminate natural distortion and contributes to the weight of the lens. The SIC cuts through the lens flare and ghosting in the cross lit and backlit. This retains the maximum color and contrast of the photos and videos. This compact and lightweight lens kit bear a durable design that makes it a great outdoor or traveling buddy. This Nikon lens kit is compatible with D3000 camera series including D3300 and later models, D5000 camera series including D5200 and later model, D7000 camera series including D7100 and later model, as well as other cameras which may be compatible upon installation of the firmware. The Nikon AF-P DX Nikkor 10-20mm f/4.5-5.6G VR Lens has big things to offer. It has an ultra-wide field of view that capture huge landscape, sharp optics, stabilized autofocus, vibration reduction, integrated coating, and featherweight build. All these amazing features, you can have, at an attractive and affordable price. 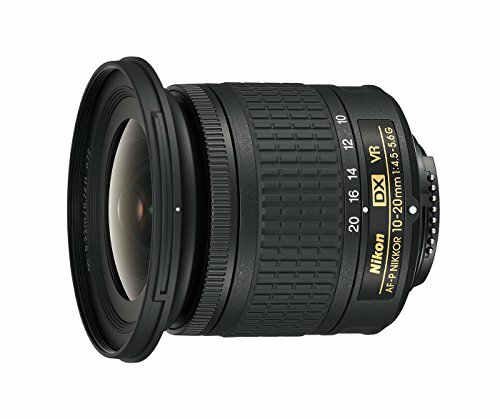 There might be some concerns with the use of the Nikon AF-P DX Nikkor 10-20mm f/4.5-5.6G VR Lens. However, with proper software editing and in-camera corrections, these issues can be easily solved. The Nikon AF-P DX Nikkor 10-20mm f/4.5-5.6G VR Lens is highly comparable with Sigma 10-20mm f/3.5 EX DC HSM since both these camera lens kit is compatible with Nikon Digital SLR Cameras. They are guaranteed to provide you high-quality photos and videos. These lens kits give you super wide angle view. While the Nikon AF-P DX Lens has a focal length of 10-20mm and a maximum aperture is f/4.5-5.6, the Sigma EX DC HSM Lens is equipped with 10-20mm with a maximum aperture of f/3.5 throughout the entire zoom range. This makes it a perfect lens for low light photography. The wide-angle lenses of the Sigma lens can accentuate the relationship of the subjects in a photo for a more creative shot. The outstanding optics of the Nikon lens allow adjustments of the aperture from minimum to maximum values. On the other hand, the Sigma lens offers a fast fixed aperture for easier and more precise control of the depth of field. This gives the photographer a better approach even when working with non-TTL Flash systems. Both these lenses are made with an innovative coating system. The Nikon lens uses the super integrated coating while the Sigma lens has a super multi-layer coating. This helps reduce the flare and ghosting to retain the color and contrast of the photos and videos taken. While the Nikon lens has three aspherical lens elements to address distortion, the Sigma lens uses four aspherical lenses to provide corrections and adjustments in distorted images. It also comes with an inner focusing system that eliminates the front lens rotation making it a better tool for polarizing filters. Both the lens kits are compatible with several Nikon camera systems. These make them a perfect combo for shooting landscape photography, architecture, and building interiors. They are also ideal for wedding photography, photojournalism, group photography, and a lot more applications. The Sigma 10-20mm f/3.5 EX DC HSM is pricier than the Nikon AF-P DX Nikkor 10-20mm f/4.5-5.6G VR Lens due to its add-on features. Moreover, the Sigma kit comes with several accessories including a petal-type lens hood, front and rear caps, and a carrying case. Overall, the Nikon AF-P DX Nikkor 10-20mm f/4.5-5.6G VR Lens is definitely a good buy considering its performance, construction, and price. This lens kit from Nikon guarantees image stabilization and wide coverage to capture the entire scene. The excellent controls aids for easier handling and operations of the user. Its compact design is ideal for traveling and transport while the modest price of this camera lens kit gives you excellent value for money. If you have extra money to spare, then you can also consider buying the Sigma 10-20mm f/3.5 EX DC HSM. This lens kit offers high-quality mechanical built for a more solid performance and great shots.